4/9/09 Lancaster to Heysham Port. We leave from platform 4 of Lancaster station. The train has come from Leeds via Skipton and waits for about ten minutes at Lancaster, whilst drivers swap ends. We leave on time and go over the river Lune on a high bridge, with views of Heysham Nuclear Power station on the left and houses on the hills of Lancaster on the right. We continue past houses on both sides and then go out into the countryside, with sheep grazing in the fields. We don't go more than 40 mph, before we slow for the junction to Morecambe, which can be seen on the left. We leave the West Coast main line behind on a single track and then join up with a single curve line from the north, which joins us on the right and then we pass bungalows on both sides, before we come into Bare Lane station. It is has it's original grey stone station building standing on platform 1 and a signal box controlling the level crossing next to the station. There are semis on the left and more bungalows on the right. The track here is unwelded so is very bumpy. There are signs of a third and fourth track here as the line bends to the right and is joined on the left by the line from Heysham. 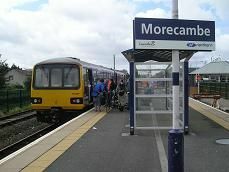 We come into Morecambe station, which has two platforms on an island platform, with a perspex shelter and a modern ticket office. It has been rebuilt in recent years. Most people get off here. You can see the mountains of the Lake District to the north through a gap in the houses as the driver changes ends. No one gets on. After about five minutes we move away again, back the way we have come. We go a little way and then stop, presumably to get the token. After about three minutes, we move off onto the single line Heysham branch. There are houses on both sides and we go past a football pitch and waste ground, going about 20 mph. Then we pass two caravan sites on the left and more houses on the right. There is a new housing development on the left and a secondary school on the right. Then we see fields on the left and speed up to about 40 mph. You can see the hills of the Forest of Bowland in the distance on the left, but more or less continuous housing on the right. There is wasteland on the left and a large modern housing development on the right. Then we go into a cutting and under the A 683. Then older houses on the right appear as we slow down and lines go off to the right as you see lots of containers and some ships docked. On the left you see the power station and there is a line going off to it. Then you come into Heysham Port station, which is just a platform with a shelter. There is a second platform, but it isn't used anymore. What is unusual about this station is that beyond the barriers, traffic coming into the dock area crosses through the covered building as foot passengers go into the terminal!